It was late morning by the time I got going. Somehow, I’d hesitated. 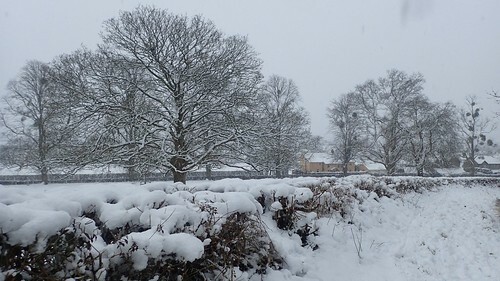 Knowing that I’d already explored the local area under snow in 2018… I wasn’t convinced that it would be worth the effort of repeating the rare experience. At the same time, I didn’t want to miss out! 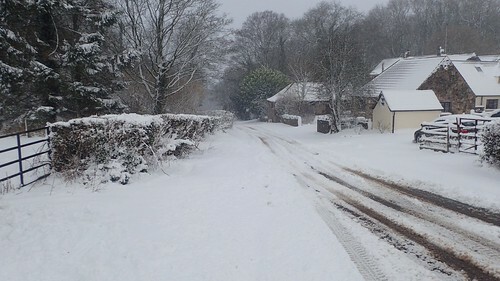 Avoiding the slushy pavement of School Road, I soon found myself climbing the partially-covered tarmac of Old Hill. 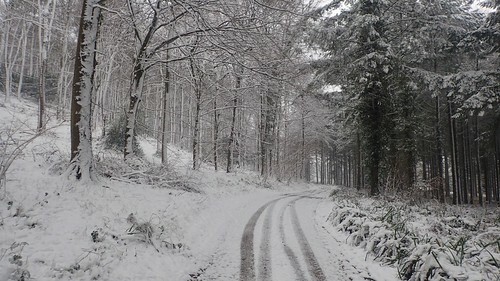 Only one vehicle (a 4×4) had made it up the hill ahead of me, where snow and ice dominated the ground beneath my soles. I recognised the personalised number plate but not the vehicle itself. 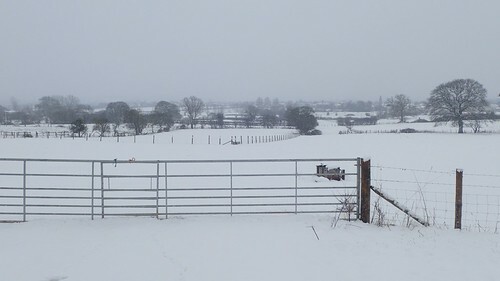 He was probably sledging from the field off Barley’s Farm, along with many others. 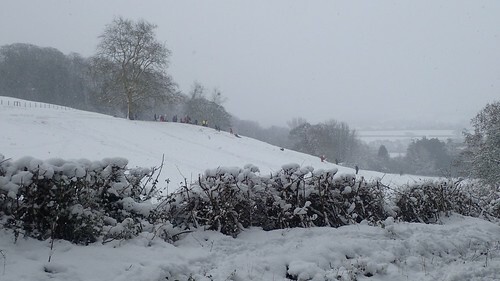 Unofficially, this is Wrington’s own sledging hill. 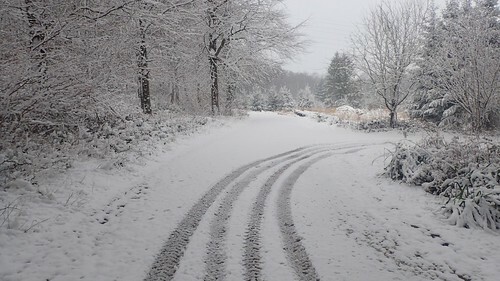 Each time the flakes settle, people will flock to this point, which officially lies on private land and away from the public right of way. I imagine the owners don’t mind. 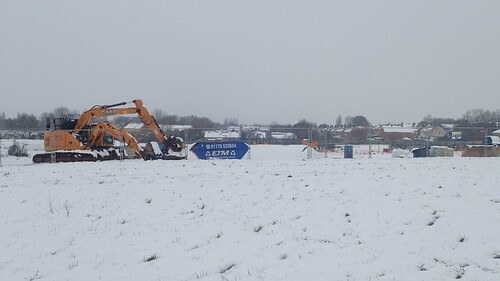 Which is more than what could be said for some parts of the country (including Bristol), where broken sledges were again abandoned on the slopes and hillsides by their inconsiderate owners. 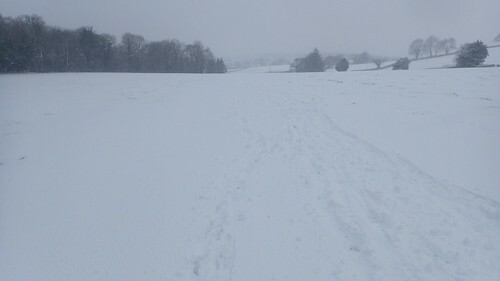 Crossing the next field towards Wrington Hill was almost like stepping in to a whiteout, as the snow continued to fall. 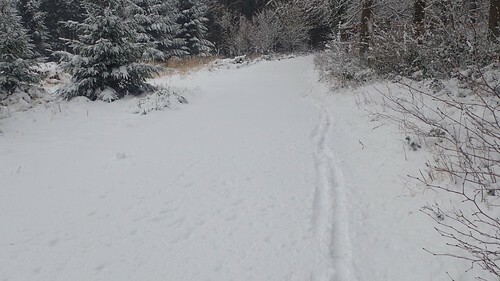 This is a popular route for dog walkers and so, I wasn’t surprised to find footsteps leading the way. 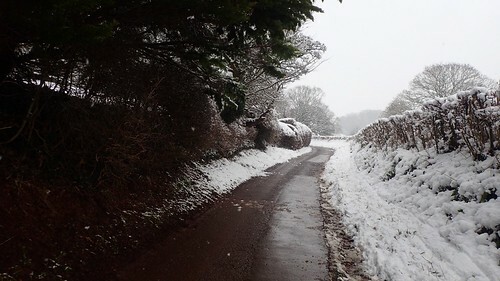 Wrington Hill is a treacherous drive (or cycle ride) on a dry day, with a descending gradient that doesn’t quite match Porlock Hill in West Somerset. 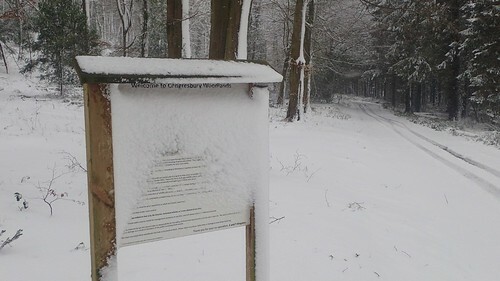 I sincerely hope no-one was brave or daft enough to try and drive down it… Even to travel uphill – with or without four-wheel drive – must’ve been a struggle. My walk continued, following the road across the top of the hill. A familiar route from my summer evening walks. Quite a nice experience, to only have to turn around and give way to a car just the one time. 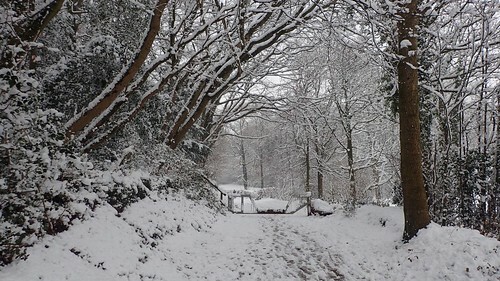 As beautiful as all of this can be, it does of course present an issue of access for people unable to travel to or from this rural location. Ignoring a footpath for Goblin Combe, I followed the road bend to pass by a beautiful bluebell wood that’s worth visiting in the spring. Turning left a bit further on, I followed the track in to the Congresbury Estate. Within these woods, shooting (pheasants, I believe) is a popular and frequent past-time. 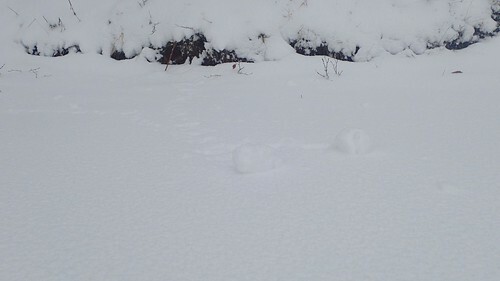 I wondered whether the snow makes it easier for hunters to track their prey. For me, this is normally a straightforward walk following a track that’s infrequently crossed by motor vehicles. Under the cover of snow, it’s extra special. Where the set of tyre tracks veered right and away from the footpath, I found that the legal right of way ahead remained untouched. Not a single footprint lay ahead of me. I only wish I could’ve captured it more clearly. I had it in mind to try and maintain this precious sight, as best as I could without turning back. There was a video by Thomas Heaton on YouTube last year, where he talked about not ruining a snow or sand shot for yourself or for others, by stepping in to it. These tiny balls of snow appeared to have come from nothing. 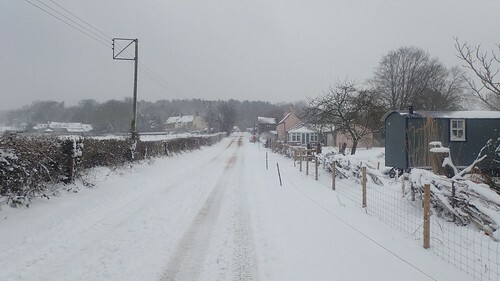 It’s possibly they were snow drifts – I saw photos on Facebook from a friend in Cheddar, who’d noticed the same effect but on a larger scale. 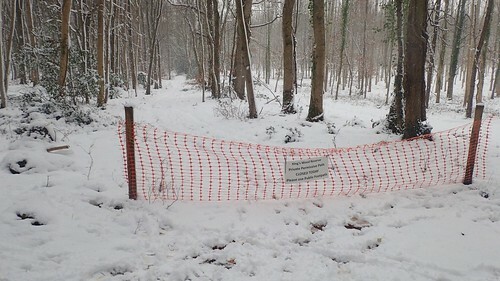 A few permissive footpaths tail off from this one and in to King’s Wood. 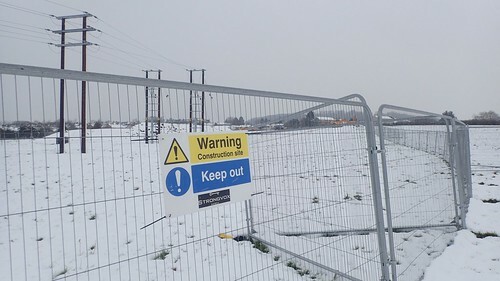 On this day though, they were closed and it looked as though someone had been around on their quad bike to put the signs and netting in place. Possibly. One final snippet of autumn colour. 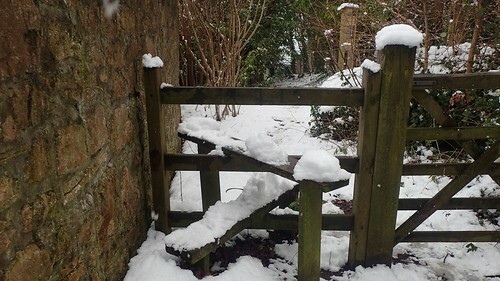 Given the choice between a stile and kissing gate, I reckon there’s only going to be one winner under such conditions. 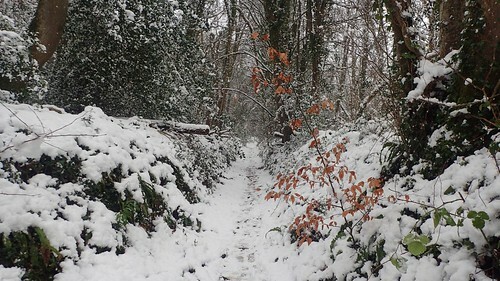 Leaving the woodland on a non-too-slippery descent, I found my way down towards the riverbank in Congresbury, which was an area I walked through in March 2018. I find it’s always sad to see green spaces consumed by many tonnes of concrete and brick. At some point, I believe we need to stand up and say ‘stop’ instead of ‘how many houses can we squeeze in to there?’. 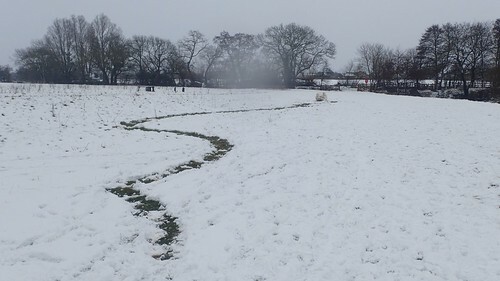 Down by the river – a popular place for the day’s snow-goers – I found my first example of an ‘unfinished snowman’… A giant ball of snow. Did the creators get cold and give up before they could create the head? Or was rolling a giant ball of snow enough for them. Something in the region of 4in of snow had fallen. 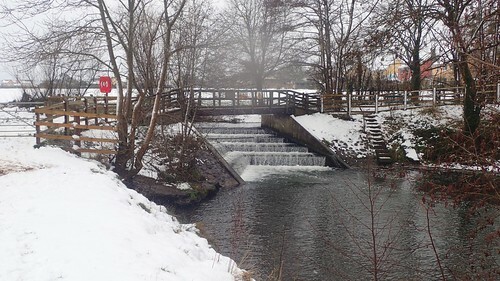 When I last came here in March 2018, the snow was deeper to the point that I suddenly sank, stepping close to the riverbank and was in it, up to my waist. From here, I could gradually follow the Two Rivers Way path back to Wrington. Although I passed a few souls, I was surprised not to see or hear more people, on this day of “regional shut down”… I suppose it was late morning and close to lunchtime. 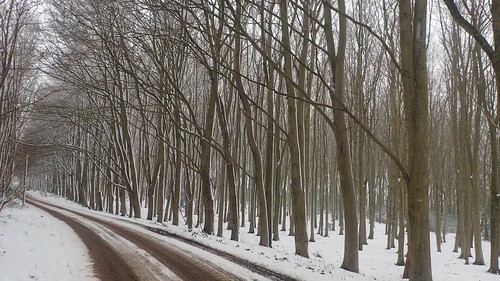 Even in the snow, I can follow my way back quite precisely. 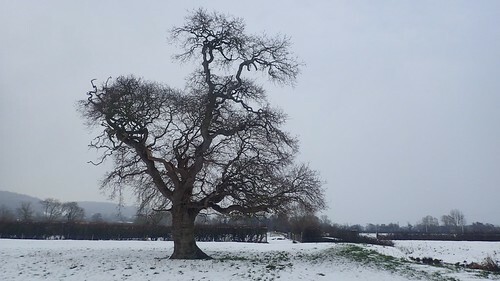 There’s one particular field just outside of Wrington that I will typically avoid due to its rutted, waterlogged nature between October and April. 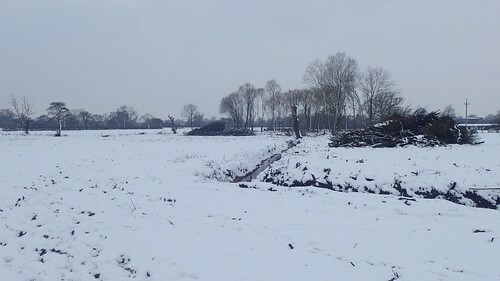 Land management work has recently been completed to remove the riverside hedgerows, open up the scene and to expose a forgotten pond. I don’t know whether this would aid the situation but it felt quite fine to me. 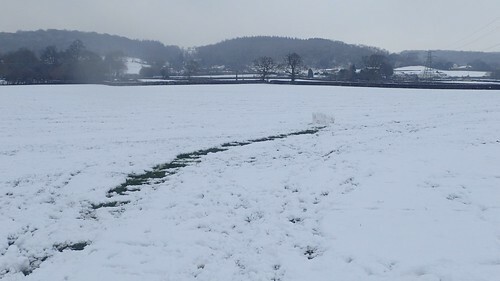 Returning to Wrington, I encountered my second ‘unfinished snowman’ of the day. 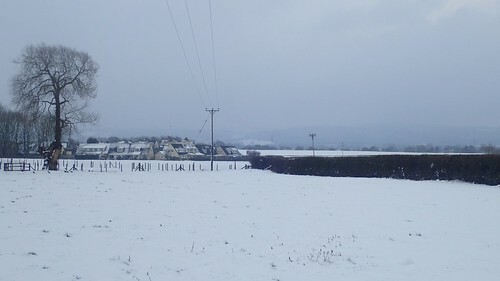 From the outskirts of the village, it was hard to get a clear picture of the Mendip Hills; barely a mile away. 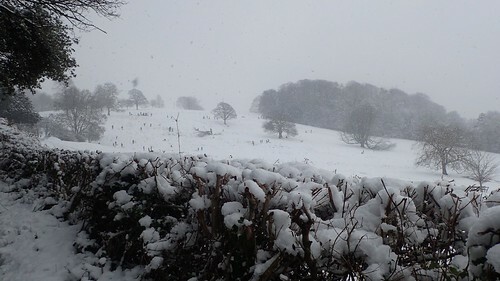 I had it in mind to visit those hills in two days’ time… You’ll be able to read about my second snow-day outing in my next post.